Cats are amazing creatures. Sometime affectionate, sometimes standoffish, but always cute and ready for treats. Unfortunately, one of their strongest qualities is that they hide illness very well. It can be really difficult to know if your cat is just fine or if it needs to visit a veterinarian right away. 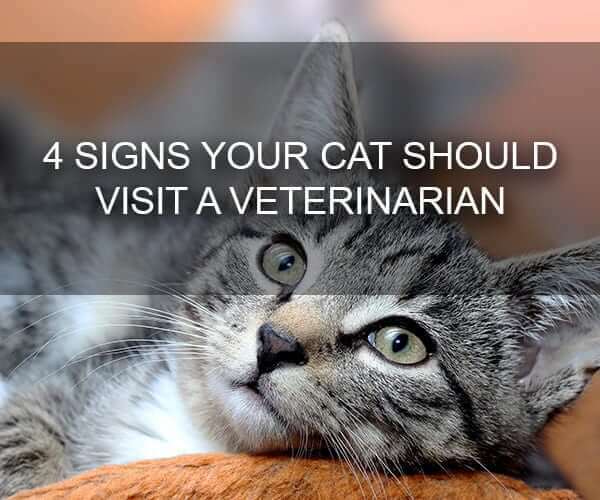 Here are some signs it’s time for a trip to the vet. Too many people don’t bring their cats for regular checkups. Somehow they think that because cats are more independent, they need less medical care than dogs or other animals. That isn’t true! Because your kitty is so good at hiding signs of trouble, by the time you realize they’re ill it could be too late to do anything. Don’t rely on noticing something is severely wrong. Bring your cat to the veterinarian regularly so that they can get checkups and problems can be spotted – and treated – early! If your cat has gone two days or more without eating, it’s time for a trip to the veterinarian pronto. Unlike humans, cats cannot go on fasts – they suffer tremendously if they do not eat every day. A cat who isn’t eating can develop fatty liver disease, a common and deadly problem. Drinking a lot more water than usual is another sign of trouble. Excessive thirst is a sign of diabetes or kidney disease. If your usually-compliant cat stops using the litter box, make sure it’s appropriately clean. If that doesn’t solve the problem, there could be an underlying medical issue. A virus or infection could be causing pain when the cat uses the bathroom, causing it to avoid the box. Cats throw up occasionally for a lot of reasons – a hairball, eating too fast, or over-excitement, for example. But if your furry friend is vomiting regularly, there’s a bigger problem. Regular vomiting is a definite indication that the cat should visit the veterinarian as soon as possible. This is especially true if there is blood in the vomit, or if the cat is also lethargic or not eating. There are a lot of medical treatments available that can help you cat feel better quickly. Don’t let them suffer – especially because it could be serious – rather than see the doctor. When you own a cat, you know what he or she is normally like. Even when you can’t put it into words, you know when everything is fine and when things seem a bit off. Perhaps the kitty isn’t as affectionate – or has been a lot more cuddly than normal. Maybe they suddenly aren’t interested in their favorite toy or treat. Perhaps they’re skipping a routine cuddle time they always showed up for in the past. If you can just tell that something is wrong, even if you can’t describe it, bring your cat to a vet. Trust your gut. You know your pet, and you know when things aren’t right! If you’re looking for a veterinarian for your cat in West Little Rock, Bowman Road Animal Clinic is here for you. We’ve been helping fuzzy family members feel better since 1997, and our experienced staff and in-house laboratory make our services quick and easier on everyone. We have pets of our own, so we know how you feel about your furry friend. Don’t be afraid to have your cat checked out – call for an appointment today!